Windmills along Wyoming’s State Road 210 tower both ominous and beautiful above the stark landscape. Their centers churn so slowly that the blades rotate at a ghostly crawl. But let your eyes drift to the blade's tip, and it silently slices through the air with dizzying speed. Across the road from these technological wonders is a procession of bison, antelope and red-hued rocks emerging from grassy fields as if waking from a long slumber. Halfway between Laramie and Cheyenne, the arch announcing the entrance to Curt Gowdy State Park opens to a surprising scene for a state known for having more cattle than residents. Bikes are everywhere. They're rolling on trails, mounted to cars and parked next to fishing rods, canoes or paddleboards in nearly every one of the park's 145 campsites. Curt Gowdy is designed for people to kick up their feet and stay awhile, with 37 miles of trail and luxurious amenities like showers and pit-toilets so clean you could eat off the floor–that is, if you're the type of disgusting individual who eats off pit-toilet floors. Campsites over Granite Springs Reservoir. Unfolding the map is like being a kid trying to wrap your mind around a Disney World kiosk. Squiggly lines of all colors sprawl across both sides of the map, enticing forefingers to trace invisible adventures. Here, you don't need to know someone to ride 'the goods.' Instead, the best trails are front and center, built by many to be shared with all. There are even numbered signs giving directionally-challenged visitors virtual 'You are here' markers throughout the trail system. 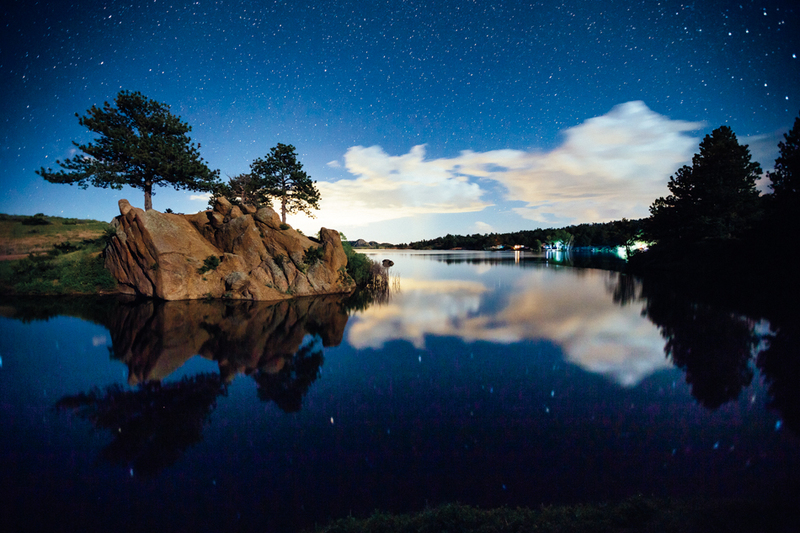 With camp erected and the shadow of dusk erasing red and purple hues from the Laramie Mountains, flickering campfires across the reservoir hover in the darkness like fireflies. At this moment, hundreds of people are leaning back in their chairs dreaming of tomorrow. It's hard to imagine that 10 years ago this trail system was nothing more than fancy plans and a hair-brained goal. After all, who in their right mind would try to create a mountain-bike destination from scratch in the high plains of Wyoming? Now's the time when whoever is telling the story of how Curt Gowdy came to be brings up Todd Thibodeau. As an avid mountain biker, outdoorsman and planning coordinator for Wyoming State Parks, his enthusiasm for the park brims through a constant smile. He's one of those guys who lives to share the land around him with others, no matter their ability, fitness or experience. He's also a guy who thinks in 10-year terms and wants to do things right the first time out. "We started with the goal of becoming a trails destination," says Thibodeau, "which meant having enough trails that you can't ride them all in one day." A plan to improve the park with 35 miles of professionally built singletrack garnered funding from federal grants, conservation groups and private donations, along with volunteer support from various user groups. Three years after ground broke in 2006, the park was designated an 'Epic' by the International Mountain Bicycling Association. Since creating the trails, visitation has increased three-fold to nearly 150,000 this past year, with riders coming from as far away as Scotland and the Czech Republic. Expert riders get an early chance to quench their thirst for tight, technical maneuvering through the rocks that are the namesake of Igneoramus. Keeping with Curt Gowdy's 'Choose Your Adventure' style of riding, you can either swoop through Rock N' Roller's rolling meadows or test tire grip on the granite steeps along 2%. El Alto is the kind of trail that makes mere mortals think, "Well, I needed to take my bike for a walk anyway." But the effort of picking through piles of boulders seemingly designed to swallow front wheels whole is rewarded when the hillside falls away, unveiling a mountaintop view that spills all the way to the horizon. By now, it's abundantly clear: This isn't a place where you whip out 20 miles in two hours. This is a place where the world spins a little slower and the trails are meant to be savored. Routes along Mo Rocca and Crow Creek turn everything you thought you knew about flow upside-down. Ribbons woven between rocks and trees feel deceptively fast, even when ridden at a plodding pace. One moment you're gazing at the chameleon-shaped rock formation towering from its bed of trees, the next you're on a two-wheeled float trip through the pines or discovering a mini-slot canyon with a waterfall to cool your head. With six 'Play Areas' composed of progressive obstacles that can entertain for hours, it almost feels like the park is messing with you by constantly enticing you to stop and play when there's so much more to ride. The east end of the park provides incredible views of Crystal Springs Reservoir along with some of the most challenging trails in the park. On Middle Kingdom, riders can sink into sculpted berms and flow off of rock slabs like water. The exposure on Cliffhanger is enough to require a bonus pair of chamois, while some of the rockiest sections of Canyons look like a giant dined on a field of boulders, spat out the craggy remnants and then called it a trail. 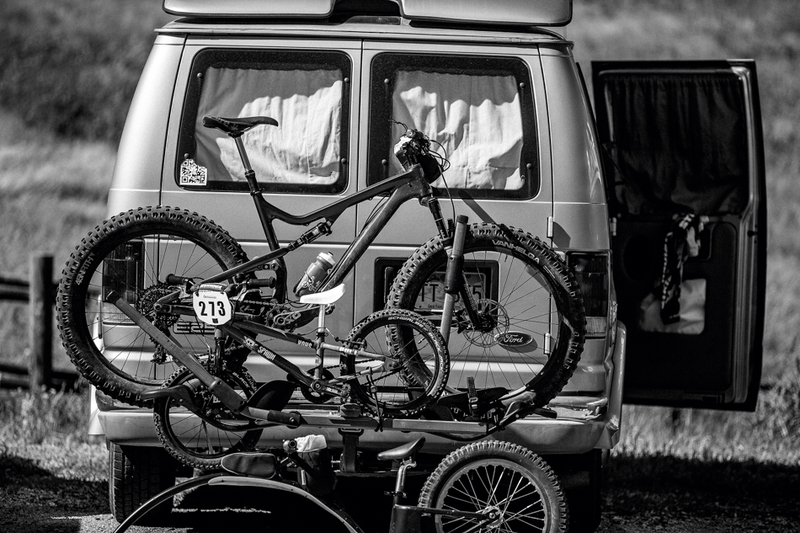 It's one of those trails that everyone hates–everyone except those who live to ride trails like that. That's the thing about Curt Gowdy. No matter what your taste–fast and flowy, slow and technical or brutally demoralizing–the adventure is yours to create. 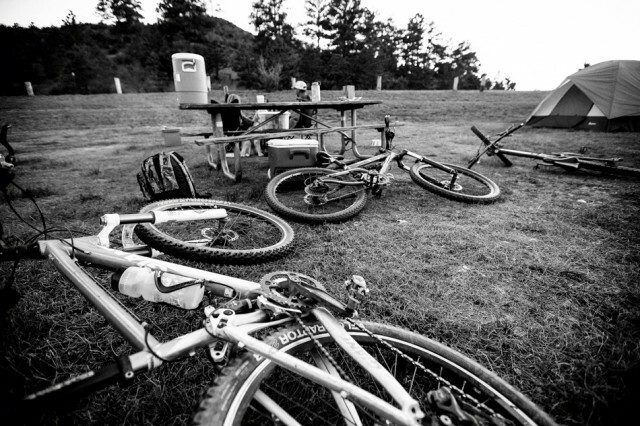 Nothing at Curt Gowdy is by accident, from its diverse singletrack, trails that feel empty even when the park is full and the way every ride is punctuated with a decadent descent. 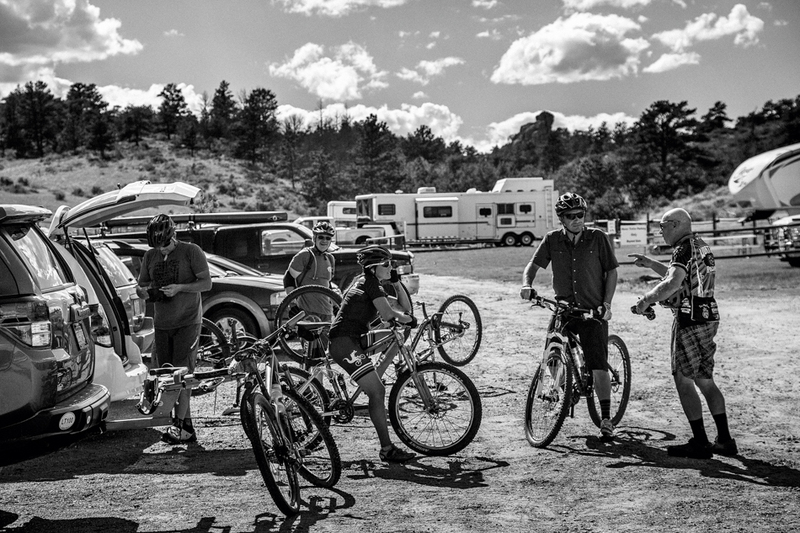 Curt Gowdy's success has spawned its own mountain bike summer camp, winter plans to groom trails for fatbiking, and a bigger–and possibly better–trail system at Wyoming's Glendo State Park. Staring up at the windmills whose appearance signal the end to yet another great ride, it's hard not to be in awe of how much power can result from a slow and methodical churn. KNOW BEFORE YOU GO | Check the weather before rolling out. At an elevation of 7,500 feet above sea level the trails at Curt Gowdy State Park can be covered in snow as early as October and as late as May. There is a $6 per day use fee. CAMPING & LODGING | With 145 campsites, a multi-million-dollar visitor center with hot showers and firewood, the $17 per night camping is the best way to experience the park to its fullest. Historic Hynds Lodge offers group accommodation on-site, but books up months in advance. WHERE TO EAT | Get your "Thai hot" on at Anong's Thai with locations in both Laramie and Cheyenne, or head south of the Colorado border for a tour of the New Belgium Brewery in Fort Collins. IF YOU HAVE THE TIME | Trek over to Glendo State Park. With 45 miles of purpose-built mountain bike trails two hours north of Curt Gowdy, Glendo can turn a long weekend into well over a week of riding. At a relatively low elevation of 5,000 feet, Glendo is often dry when Curt Gowdy is under snow.